My boys are Angry Birds addicts. Whether playing the original Angry Birds, or the latest Angry Birds: Space, they love flinging those feathered fighters to pummel some pigs. 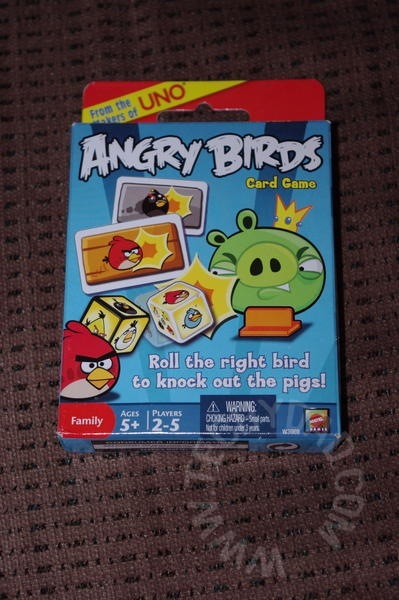 So when we saw the Angry Birds Card Game in a local store, we had to buy it for them. After the second Seder, we gave it to them for finding the Afikomen. (Quick explanation for those not in the know: During the Passover Seders, a matzo is broken in half. Half of it is hidden and kids get to hunt it down. The one who finds it gets a prize.) 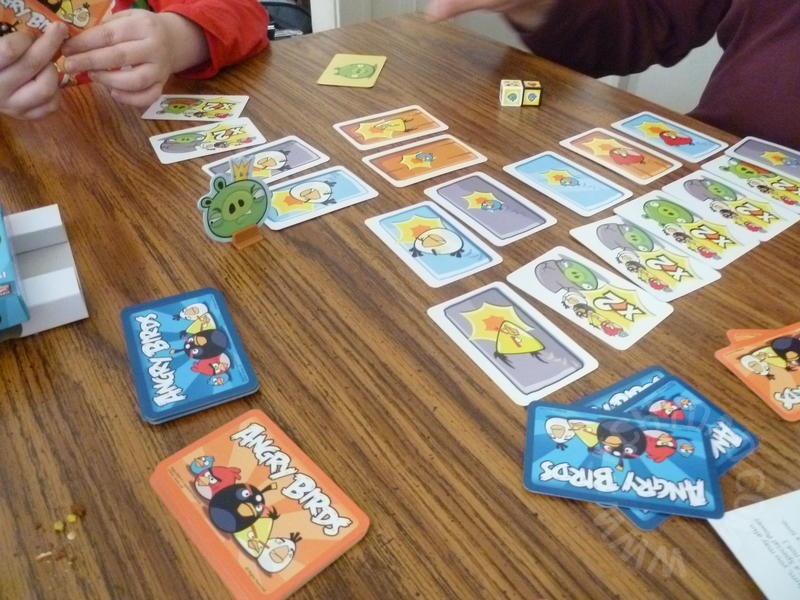 The next day, we sat down to play some Angry Birds cards. The play is very simple. There are five different kinds of birds (Red, Yellow, Blue, Black, and White). 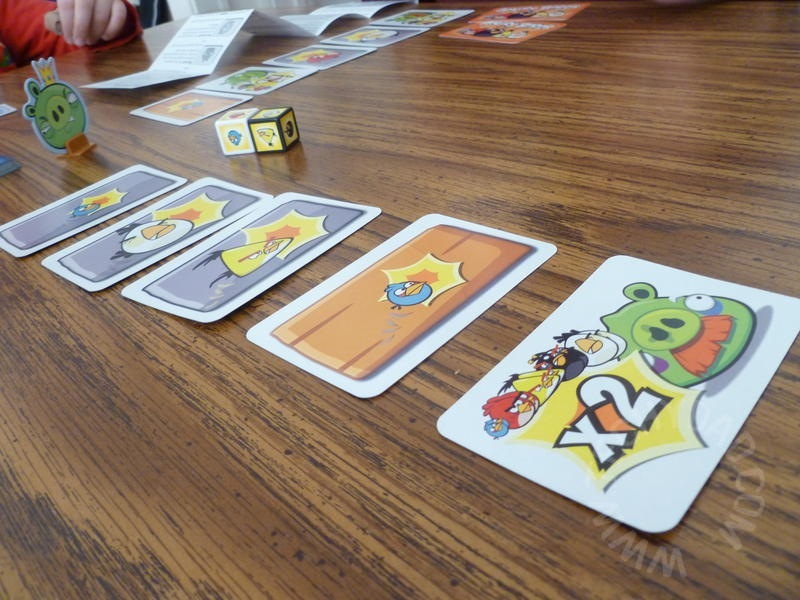 Each of the structure cards (the equivalent of the buildings that the pigs are usually positioned upon) have either one of the birds on them or a "X2". (The latter require two matching birds.) There are also special cards with actions like blocking someone’s turn, allowing yourself a re-roll or making them draw another structure card. There’s a six sided die with one bird on each face, plus one "Wild Bird" face featuring all of the birds. There’s also a King Pig to stand in the center. 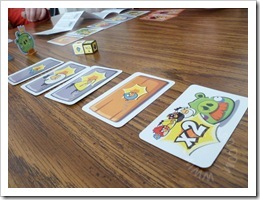 Each player is dealt 6 structure cards and places them in a line from them to King Pig. 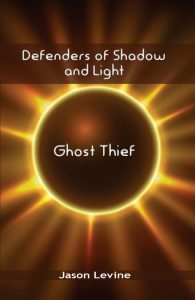 The players also get 2 special cards, but keep these secret. 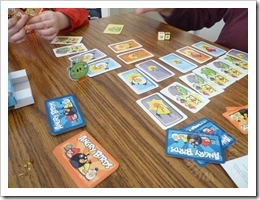 The first person rolls and uses any birds they can to remove structure cards. Then, the next player does the same. 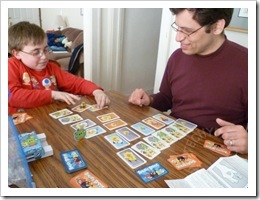 At various times, players can also use special cards to affect the gameplay. When a player has removed all of their structure cards, they get the chance to knock down King Pig by flicking a die at him. The first to knock over King Pig wins. We found this game highly entertaining. JSL only played one game with us, but he’s on the low end of the age range. NHL, who is firmly in the age range, loved it and kept begging to play "just one more game." Overall, I only had two problems with the game. First of all, it went by a bit too quickly. The 6 structure cards were gone pretty fast and the 2 special cards were used up way too rapidly. 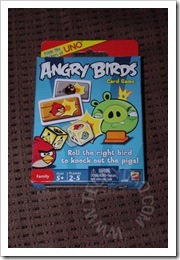 Secondly, flicking a die at a pig might simulate the Angry Birds computer game, but it can lead to die flying out in unintended directions. We solved the first problem by expanding to 10 structure cards (2 towers of 5 since we had no room for a tower of 10) and 5 special cards. We also changed how King Pig gets bumped off in the end: Players now had to roll a Wild Bird to get to knock him over. This is definitely a game that we will be playing over and over. I really liked how the game went by quickly so that you could play multiple games in a single gaming session. This meant that more than one player got the chance to win. (NHL beat me quite a few times.) Our expanded towers also meant more dramatic come from behind victories as special cards or lucky rolls eliminated multiple structural cards on each turn. Given how portable this is, we will be packing this to take with us on our upcoming Disney trip. While it won’t make for a good airplane game (those tray tables are just too small), it will be perfect for the hotel room. The looks like a lot of fun and a nice change from video games. There’s something to be said about holding playing cards instead of using virtual ones. 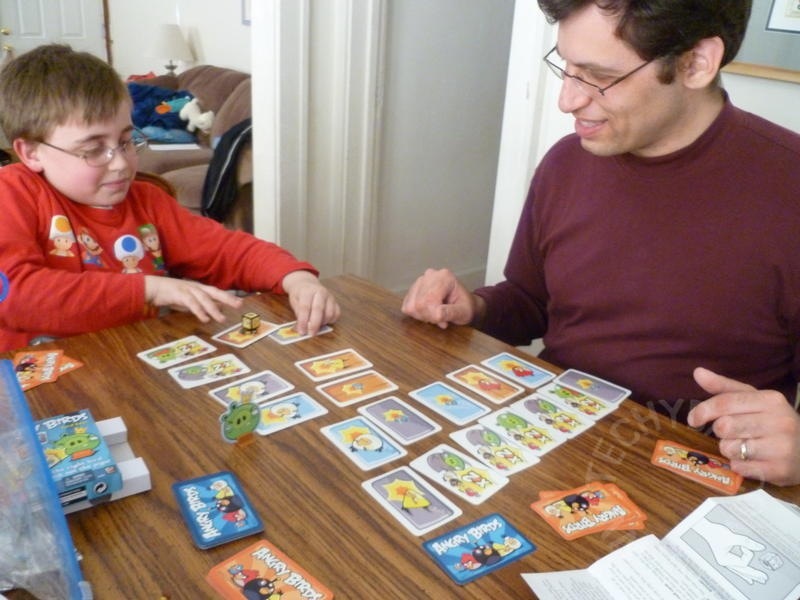 The tactile feel enhances ownership of the game playing experience.